This Café Libro we celebrate Black Herstory Month by honoring, reading, singing, reciting the original and curated work of Black women authors, writers, artists, musicians, and cultural creators. In The Heart of the Mission, Cary Cordova combines urban, political, and art history to examine how the Mission District, a longtime bohemian enclave in San Francisco, has served as an important place for an influential and largely ignored Latino arts movement from the 1960s to the present. Theses projects are supported in part by the Cultural Arts Division of the City of Austin Economic Development Department. Visit Austin at NowPlayingAustin.com. Resistencia Bookstore: is a liberated space for independent thinking, community building, and creative & revolutionary vision. 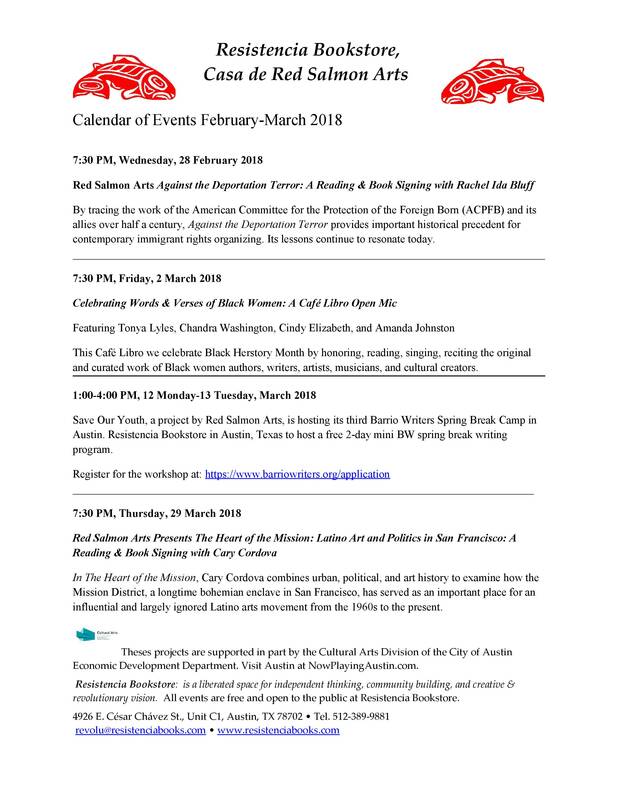 All events are free and open to the public at Resistencia Bookstore.